After traveling for over 24 hours visiting all of our grand children and big kids, I always feel like I need a couple days to re cooperate. With laundry piling up to no foreseen end, I just want to push it all aside and bake. I finally ordered a tart pan with a removable bottom, why has it taken me so long? I always thought that you had to be a professional chef to use a tart pan, I was so impressed by how beautiful fresh fruit tarts looked and always bought one for a party, but those days have ended. I have lots of ideas in mind for this tart pan!! 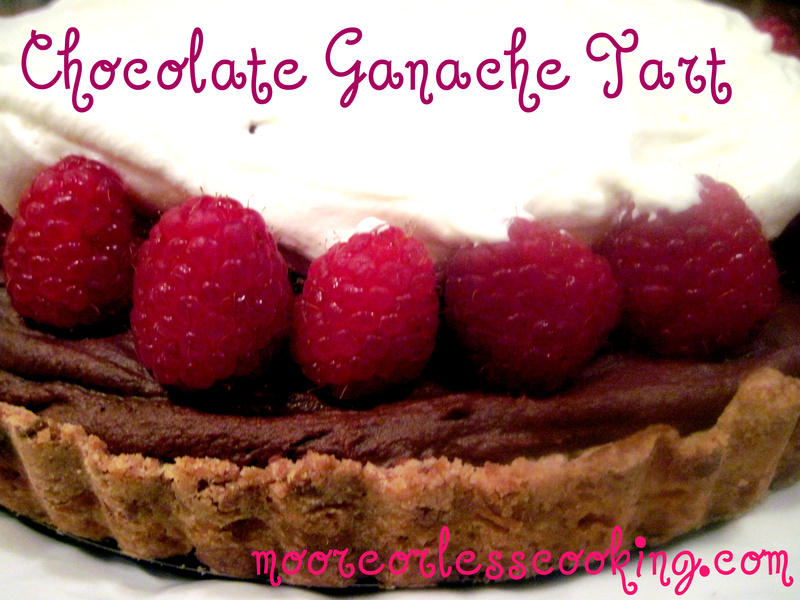 The Chocolate Ganache in the recipe calls for Dark Chocolate, but since all of the dark chocolate that I have in my pantry has some sort of nut mixed in, I used Ghiradelli Bittersweet Chocolate, it is perfect with the raspberries and fresh cream. I used Trader Joe’s Whipping Cream, a new product that they carry, does not need to be refrigerated, I love this, you never know when you need whipping cream…always!! Oh, and I love this crust…yes I have a weird phobia about crusts, but this one is a press in the pan crust, pop it in the freezer before baking, Voila, easy peasy! So go ahead and get yourself a Joy The Baker Cookbook from amazon.com or Barnes and Noble, if you haven’t already. You will want to try this fabulous dessert to impress all of your friends, I know mine were really impressed! In a large bowl, combine flour, sugar, salt and spices. Cut in butter with fingers until well incorporated. Some butter chunks will be the size of small pebbles, others will resemble oatmeal flakes. Once incorporated, add the egg yolk and bring mixture together with a fork. Dump mixture into a 9 inch tart pan (or 9 inch spring form pan) and press the crust into the sides and bottom with your fingers. Place in freezer for about an hour. Place chopped up chocolate in a medium sized bowl. In a small saucepan over medium low heat to a very low simmer. Pour half of cream on top of chocolate and let stand for about a minute, then whisk together. Add in the rest of the milk and butter. Stir until butter is melted. Place in the fridge and stir every 10 minutes until it sets up a little bit. Place a rack in the upper third of the oven and preheat to 350ºF. Butter a piece of foil and place butter side down on top of chilled tart. Bake for 20 minutes, then take foil off and bake for another 15, or until golden brown. I love that tart and the pastry too.